Read more reviews at What Danielle Did NextAs soon as I saw this pop up on a friends TBR on Goodreads I *had* to have it! Nerd, comics, sci-fi, conventions, adorkable hunks, like hello my dream life! My life is pretty much as listed above except for the absence of the adorkable geeky boy...sigh one day!! Our heroine is Maddie, the quintessential popular girl in high school. Cheerleader, dating the quarterback, knows the dance moves to all the hip songs and is seen in all the right places...except she's also a huge geek about comic books, sci-fi and all the other delicious things we nerds love! An incident when she was 12 where she was made fun of her nerd loving ways has made her wary of sharing her secret love and she's built up walls separating Maddie the cheerleader and Maddie the Nerd. 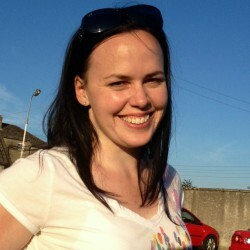 Hence her double life. When her favourite comic book's latest release isn't delivered to her house, she must venture into nerd heaven, the local comic store, a place she's only dreamed of visiting and face cute adorable Logan, who she's harboured a crush on for months. The story is really a lot of fun and there's some amazing scenes including LARPing which I really want to do now and some great comic book conversations that were right up my street. Maddie is really likeable but at times it did frustrate me how unwilling she was to embrace her nerdy ways as it meant relationships with friends and family were constantly under strain with her lies about who she's with and where she is especially considering the people she's so afraid of judging her like her boyfriend and best friend never say anything bad about comics etc. Her friendship and burgeoning relationship with Logan was without a doubt the high point of the book! He was so sweet and butterfly inducing in every scene and I wanted to squee at every moment! There's one scene where he dedicates his show to Maddie that was so sweet I was like a puddle of swoony goo! All the secondary characters were well realised and fun to get to know especially Logan's family and Maddie's dad and a special shout out to Logan's bff Dan who is simply hilarious! The message about being true to yourself and facing your fears comes through clearly and reminds you that whether you're in high school or not, the only self that can truly make you happy is yours. 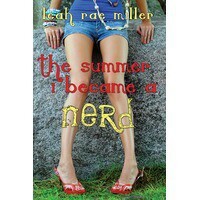 The Summer I became a Nerd is a short, sweet, fun read ideal for summer and guaranteed to put you into a good mood!